We have excellent sports theme nursery ideas to share with you whether you are expecting a baby boy or girl. 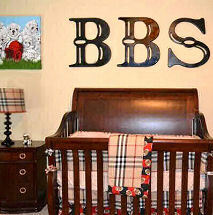 I can remember when a baseball or soccer themed nursery was for baby boys only. Today, a girl is just as likely to be outstanding in sports from soccer and softball to tennis. The only difference as far as nursery décor is concerned is that the color scheme will most likely be pink rather than one with masculine colors. Whether you are shopping for pink, blue or gender neutral sports crib bedding there are cute collections that will put you on the right path in decorating your little all star's room. There is sure to be more than one that will be approved by both you and your husband. Can a baby boy's sports nursery theme be elegant yet still be "rough and tumble" enough to please dad? You bet it can! 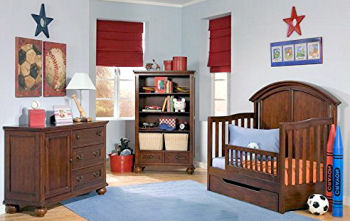 Designer fabrics in earth tones or your favorite team colors can be both refined and "all boy"! Most sports crib sets that you will find ready made in the baby boutiques will include a variety in their design rather than to focus on any individual sport. 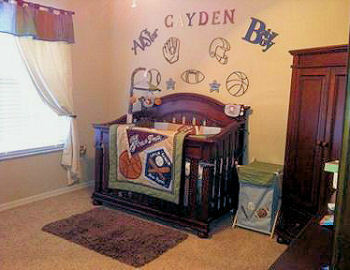 See more pictures of this miracle baby's sports nursery theme HERE! A neutral baby's sports theme nursery collection might have pictures of balls, bats or equipment associated with every competitive sport from soccer to ice hockey. If you would like to have a football or baseball baby nursery, you may decide to have a set custom made. With a set of custom made sports crib bedding, you have the luxury of narrowing your theme to your chosen sport. 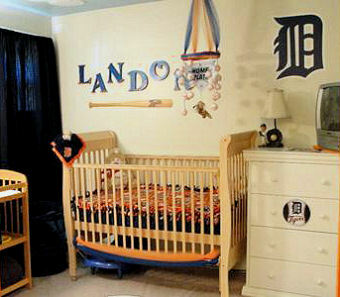 See more pictures of this baby boy Detroit Tigers baseball theme nursery with sports bedding and baseball crib mobile HERE! For instance, you might want to take this chance to use your favorite team’s logo a focal point in your baby's room. The team mascot might be featured on the crib quilt or by using your team’s colors as the inspiration for a color scheme. That is the beauty of choosing your own fabrics and either making your own sports crib sets or having them sewn rather than to buy them at a store. 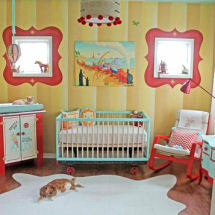 Do you have a great set of baby bedding or a picture of a nursery that you decorated? Share it! FLORIDA GATORS FOOTBALL NURSERY! 2008 CHAMPIONS! Once you have your crib bedding, the fun of decorating your baby’s sports theme nursery really kicks into high gear. This may be the time to take a trip to the pro shop and pick up some official licensed merchandise to use as decorations (always keeping baby’s safety in mind). You can often pick up area rugs and decorative wall hangings with the name of your team or photos of famous ballplayers that you can frame and use to decorate the walls of the baby’s room to lay the groundwork for a very personalized sports theme nursery. Chances are that you have some framed baseball wall art, posters or photos that you took yourself that would really shine in this style of nursery decor. A boy's nursery with the perfect set of sports baby bedding as the decorating inspiration piece is an opportunity for parents to introduce their infant to the exciting world of athletics at a very young age. Their lifestyle will inspire a stylish, modern room that reflects America's favorite pastime. Return to Unique Baby Gear Ideas to see the latest in sports nursery ideas, crib bedding sets and decor for the family's next sports legend.